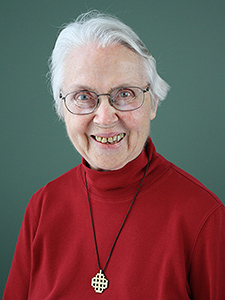 Sister Esther Heffernan, O.P. (née Jean Heffernan), was born in Seattle just a few months before the Great Depression, when her lawyer father’s grain exporting business failed. The family moved to Prescott, Arizona where her father got a job as the assistant superintendent of schools. He would soon die, causing her and her mother to eventually move to Walla Walla, Washington, the town where her school teacher mother attended college. Sister Esther attend several schools in the following cities: Phoenix, Arizona, Rosalina, Washington, Walla Walla, Washington, Seattle, Washington and finally Eugene, Oregon. She did not graduate from high school as she, at age sixteen, went off to the University of Chicago where she graduated two years later with a Ph.B. in Liberal Arts. She has an M.A. in Social Sciences from the University of Chicago. From 1951-1953 she studied Liberal Arts and Theology at Rosary College (now Dominican University). From 1954-1955, she studied History and Physics at Creighton University. She got her Ph.D. at Catholic University of America in Sociology/Politics/Catholic Social Thought in 1964. The title of her dissertation is Inmate Social Systems and Sub-systems: the Square, the Cool, and the Life. Sister Esther taught at Edgewood College from 1956 to her retirement, but also had teaching positions at Catholic University of America, Rosary College, and St. John’s College in Cleveland, Ohio.